Mystical Faction: What do you make of Katie Hopkins? Katie Hopkins is a British tabloid newspaper columnist and television personality who has become notorious for her controversial opinions on the woes of modern society. She is especially active on the social media network Twitter, where she appears to be waging a crusade or a psychological and ideological warfare campaign, under the Twitter handle @KTHopkins. For her part, Katie Hopkins maintains that she is 'telling it like it is'; giving voice to opinions that she believes society really thinks but is afraid to or too politically correct (PC) to openly talk about; and that it's 'all panto'. I'll let you decide. Like Marmite (a popular brand of yeast extract), some love her for bravely stating and standing by her beliefs, and for what they see as her brutal honesty and for her wit; while others hate her for what they in turn see as attention-seeking, narcissistic, monochromatic and inflammatory right wing views. She is nothing if not provocative and divisive. Anyhow, let's first look at some of the reactions to Katie Hopkins by her lovers and haters (bearing in mind that many supportive tweets and irate tweets featuring the 'C' word have not been reproduced here). I've deliberately selected a substantial number of tweets to illustrate this, because of the preponderance of rhetoric and vitriol over sound policy to be found in the online 'debate'. If you read the Guardian interview that Katie Hopkins gave, you'll see why she is immune to such abuse; indeed, she simply laps it up. 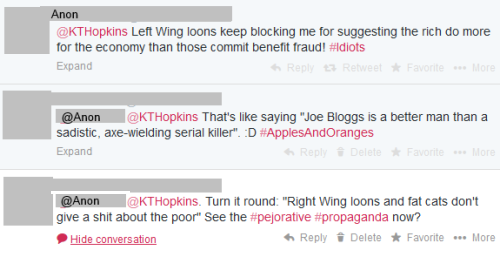 Then let's look at Katie Hopkins' own tweets, so that you can get a better idea of her views. Common sense is not quite as common as some might imagine. A scary prospect. A view evidently not shared by all. The bedroom tax is a welfare reform which cuts the amount of housing benefit that people can receive if they are considered to have a spare bedroom. And that does not even touch upon the very real anxiety and hardship that this much criticized welfare reform has caused, not least for the sick, the disabled, the vulnerable and their carers. 'Benefit fraud: the public think that £24 of every £100 of benefits is fraudulently claimed. Official estimates are that just 70 pence in every £100 is fraudulent - so the public conception is out by a factor of 34' says a survey in The Independent newspaper. Perhaps she should write a book? How about: Human Resources Management in a Post-Democratic Society? 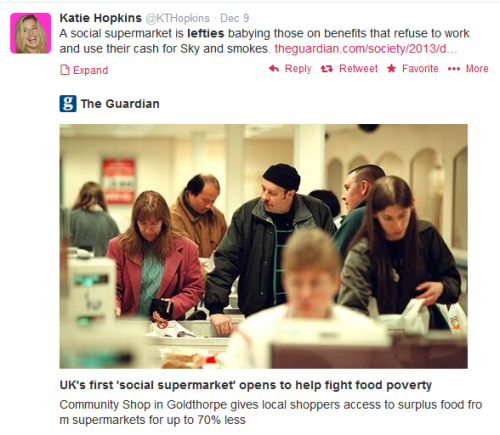 Just in case you didn't read that, I'll repeat Katie Hopkins' words: 'I have no compassion for those less fortunate than myself. I find it intensely liberating.' You can find this tweet on the Internet Archive's Wayback Machine. 'Jesus of the outspoken'? Really? More like the Antichrist, metaphorically speaking, given Katie Hopkins' avowed lack of compassion for those less fortunate than herself. 'Access to foodbanks should be limited to the truly needy', I could go along with. But 'Foodbank users would be reduced to 0 in 24 hours'. Presumably NHS acute admissions and the morgues would take up the slack, and at what greater cost? You can find this tweet on the Internet Archive's Wayback Machine. 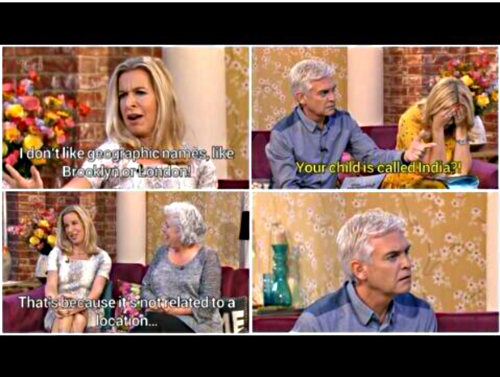 Katie Hopkins' world is so cynical and black and white, without even shades of grey, let alone colour. This kind of monochromatic view, cast iron certainty and lack of compassion are not great virtues to base one's whole life philosophy and media career upon; they are perhaps more symptomatic of stunted development and socio-emotional handicap? Rightly or wrongly, some have even speculated that these are symptoms of sociopathy. Admittedly, Bob Crow did rejoice at the death of Margaret Thatcher, but two wrongs don't make a right. If her mind is already made up, and she's just looking for confirmation bias, then it can hardly be called a debate, can it? I guess that one poor person's 'abhorrent debt' is another person's 'justifiable business expense'? 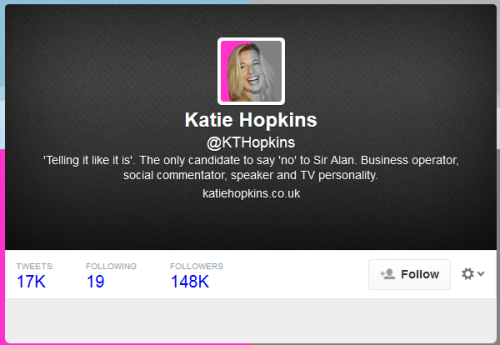 Katie Hopkins Limited is not exactly a paragon of success. What happened at this sensationalist 'freak show' is that they purposely chose unrepresentative examples of people in debt, and people like Katie Hopkins gleefully (and incorrectly) extrapolated that to come up with a false generalization and played on the stereotypes. This is yellow journalism at its most insidious. There was a recent piece in The Guardian's 'Comment is Free' section that excellently summed up this sadistic moralizing and manipulation in the media. Good lord, no, we mustn't blame the advertizers, the bankers or the politicians. 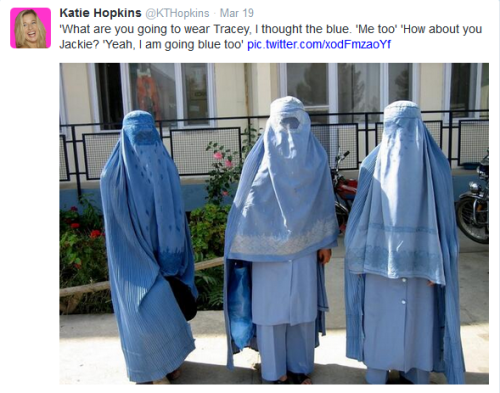 I guess Katie Hopkins hasn't watched the excellent documentary series The Century of the Self? And in a typical lack of joined up thinking, on the one hand she criticizes people for getting into debt, whilst on the other hand she praises the wonderful business model of the pay day loan sharks. Go figure. I do wonder why the regulatory body Ofcom does nothing to curb this recent growth in inflammatory neoliberal propaganda. Judging by the ignorant prejudice and hatred fuelled by such programmes (as witnessed in many trending topics at Twitter), I also worry for the wellbeing of the poor and the vulnerable, the majority of whom are decent human beings. It is deeply disturbing to see these people so unsympathetically tarred with the same brush as a 'rogue' minority and branded an intolerable burden on society. And it is surely only a matter of time before one or more of these vulnerable people take their own life as a result of this media frenzy, or as a result of the rabble stirred up by Katie Hopkins' own actions as the self-appointed Witchfinder General. Here, there appears to be a disconnect between having a thought and its verbal expression; a lack of what she herself would call a 'filter' and others might perhaps justifiably call 'foot in mouth disease'. Doh! 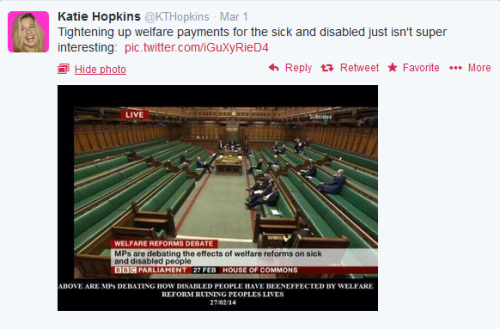 Read the caption: 'MPs are debating the [adverse] effects of welfare reforms on sick and disabled people.' That's how much they care. But never let the truth get in the way of a good story, eh? Note the way in which she cannot resist the opportunity to dehumanize and demonize people and also play the class card here: the fat; single mums; their supposedly ugly kids, and even their use of presumably inferior public transport. 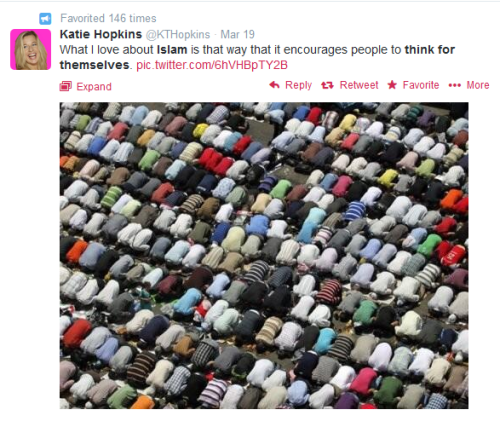 Katie Hopkins is a firm believer in telling people what you think about them. In that case, Katie Hopkins should prepare to be mortified by the news that her idol, Margaret Thatcher was a healthy size 14. UK size 12 is 'medium' or US size 8, by the way. This was Marilyn Monroe's dress size and if you check photos of her, you'll see that she was certainly not fat nor -- thankfully -- a stick insect but pleasantly 'curvaceous'. Okay, so the child has been mistreated, I grant you that. 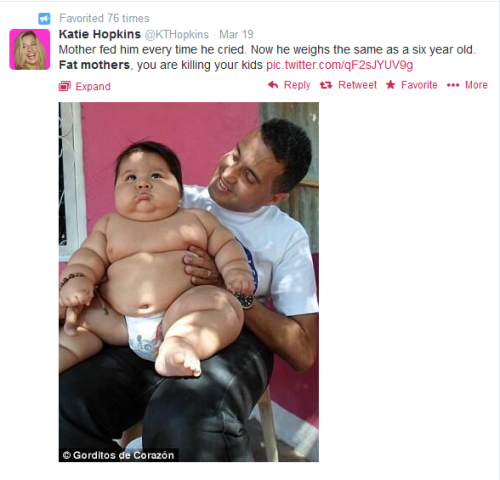 But again notice how one extreme example is given and from that she incorrectly extrapolates to a generalization or stereotype that 'fat mothers, you are killing your kids' with the intention of adding to the stigma. It's a little known fact, but there is a rather more insidious human condition, and it is known as a morbidly obese ego. At last, something that we can agree on! Thank you, indeed. The people who actually use or run the food banks would beg to differ. Needless to say, this tactless simile went down like a lead balloon. Again reinforcing the idea that the poor are benefits scroungers. Classism again and associating poverty and benefits with scrounging or even criminality. You mean like 'Whites Only' or 'Keine Judes'? Oh dear, the great unwashed of the lower and menial classes. Again, one extreme example being used to reinforce a prejudicial stereotype. You wouldn't say 'a Christian pervert'. Women need support, more than being subjected to such 'wit'. So, how do you manage to incite hatred without quite crossing the line yourself? Just like that. You supply the 'ABC', let your extremist supporters supply the 'XYZ' and take no action to distance yourself from such responses. Then, when questioned, all you have to do is claim the right to free speech, and refuse to take personal responsibility for what most reasonable people would see as a foreseeable, inevitable and undesirable outcome. It is to be hoped that one outcome of the #Leveson Inquiry will be to regulate the use of social media by the press and by broadcasters. However, I won't hold my breath. You can find the last tweet, about Islam inflicting maximum pain and suffering, on the Internet Archive's Wayback Machine. Under British and European law, everyone is entitled to justice, such as a right of appeal, no matter how heinous their crime. To restrict those rights, let alone apply mob rule, would be dangerous and disastrous for our democracy. Those who need it most just don't 'get it', do they? 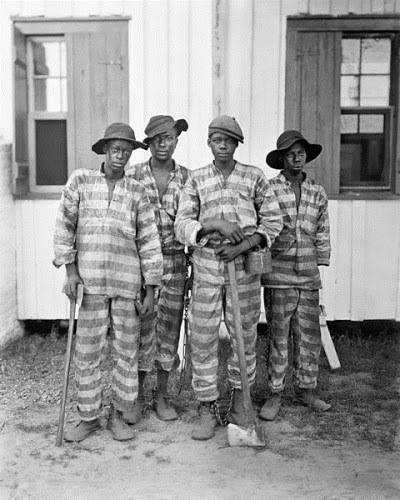 For one thing, it sensitizes one to interpersonal and social issues. In November 2013, Katie Hopkins and journalist, television presenter and model, Peaches Geldof met on the ITV show This Morning for a fiery debate on attachment parenting. The following year, on 7 April 2014, Peaches Geldof was unexpectedly and tragically found dead at her home. At Twitter, Katie Hopkins did not join other celebrities and fans in offering their condolences to Peaches' family, and not unnaturally Katie Hopkins was inundated with angry and hateful tweets reminding her of the spat and asking or demanding to know when she was going to offer her own condolences. For four days, Katie Hopkins doggedly maintained her silence and then on Friday 11 April she broke her silence with a lengthy column in the Sun newspaper to explain her silence. 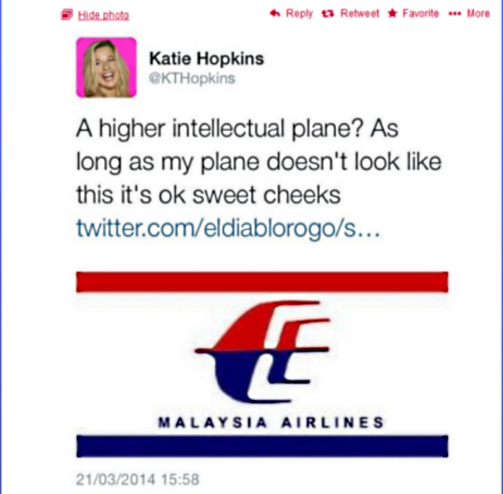 The thoughtfully worded article was very well received by perhaps 99% of those who read it and Katie Hopkins spent most of that day tweeting and retweeting the link to her article in the Sun and thanking and retweeting her many newfound or born-again admirers who praised her for her honest, sincere and heartfelt words which were, they said, 'spot on'. Like Jesus' turning water into wine, to go from 99% hate to 99% love on the clapometer overnight is no mean feat and she deserves credit for the article. Only a very small minority of spectators could see and pointed out the glaring irony or questioning the motivation behind this sudden and unexpected charm offensive. 'It's a miracle,' wrote one. '@KTHopkins' sins have been washed away and her soul has been redeemed!' together with a link to a YouTube video of the baptismal scene and 'instant conversion syndrome' in the film O Brother, Where Art Thou? Whichever way you look at it, it did turn out to be a most fortunate PR coup. Katie Hopkins also seems to forget that this is life and that people have feelings and not, thank God, the authoritarian army parade ground where conduct is mechanically governed by rules and regulations. As the Guardian interview also suggests, Katie Hopkins so often seems to believe that her personal opinions and her personal choices are somehow Universal Truths worthy of the highest reverence, and I don't think that Katie Hopkins has much of a clue about what might or might not be going on in other people's hearts and minds, particularly when feelings or emotions are involved. 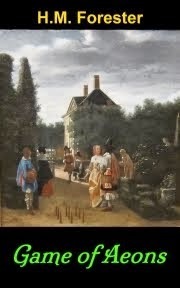 If people consciously choose to be Stoic or choose to maintain a stiff upper lip, then that is all fine and good -- as is their right to openly express their own feelings in a way of their own choosing or according to their needs at the time. But in some cases or in certain circumstances -- for example when it is habitual, compulsive or wholly unconscious repression -- maintaining a stiff upper lip may be contraindicated and can actually be very harmful. So such ill-considered advice from the self-appointed Anti Agony Aunt really should carry a prominent government health warning. Posted on Holocaust Remembrance Day (Yom HaShoah) 2014 of all days, you can well imagine that Katie Hopkins was inundated with replies to this ill-considered and ill-timed suggestion. I mean, who is her publicist -- Joseph Goebbels? Maybe she should approach Max Clifford? Oh no, on second thoughts, maybe not. You can find this tweet on the Internet Archive's Wayback Machine. Perhaps this is the kind of thing that she had in mind to humiliate the unemployed and push some of them over the edge? Hardly appropriate, surely? Is it wit? Is it vulgarity? Is it foolishness? Or is it symptomatic? Is the kettle calling the pot black? I don't at all like the word 'shame', since at the end of the day 'we're all in the same boat' here on planet Earth. Nor 'sin', since we all 'miss the mark' at one time or another. But certainly things like conscience and remorse are useful human qualities? So is Katie Hopkins bravely exercising her right to free speech and playing the witty panto villain? Does she at times verge on incitement to hatred? Is she a mouthpiece for propagandists? Does she dehumanize and demonize the underprivileged and vulnerable? 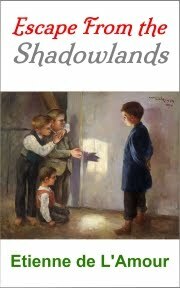 I'll leave you to check out Google for further information on propaganda and the techniques employed and (bearing in mind that I am, of course, biased myself) to decide for yourself.